I know, You’re going to say “another Mario Kart Like” on the market. Hold on! We haven’t started yet! “3DClouds.it” formally Formex is the game developer company that worked on this piece. They have been on the business for a while and has created assets for successful titles such as Moto GP, SuperBike, Sebastian Loeb Rally, Ride, Ducati Challenge and Valentino Rossi The Game. The game content is translated in 11 langages (French, English, Italian, German, Spanish, Japanese, Korean, Portuguese, Russian, Simplified Chinese and Traditional). Thanks to the publisher PQube we got a copy and could play it a month before the official release on the 31st of July. 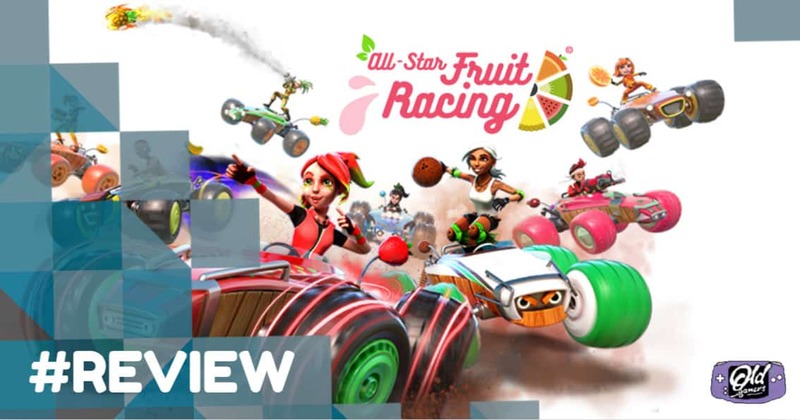 So we played All-Star Fruit Racing on Nintendo Switch, Xbox One, and PS4. Steam version is also available for PC players. This review will tell you more about what our 3 testers thought about the game and what makes this game a decent game or another sinking one. At the end you “the users” will decide. Our review is based on 4 simple aspects of the game and should cover most of the thing you will ask yourself before purchasing the game. How is the game? What does it look like? Did you enjoy playing? and What do you really think about it? You will pick a Fruity character depending on the way you play (offensive or defensive). You can choose to play up to 10 racers on a custom championship. We jumpstarted with The Career Mode, playing the different worlds that have 3-4 races each. On the track, you can pick up weapons to throw at your opponents and performed moves according to combinations. Each character has a special move. The control is pretty smooth and mastering your kart and the drift is darn simple after passing the training mode. If you’re familiar with Mario Kart, this game is a piece of cake (or fruit). But be careful yours drifts have to be well managed otherwise you will lose power and burn your engine. The shorter you drift the better you will be. All karts are the same speed so you focus on your driving skills and the combinations of fruit to either attack or defend yourself. I find this Mixer is a genius idea. We gotta say, all 3 testers thought the visual aspects and the races are very nice and interactive. Play on a 4K screen is fabulous. If you have watched our Live Twitch for this game, you could see the Jurassic race one, which is my favorite because a T-Rex will chase you for the last lap. You can custom your vehicle, with tones of items but it won’t help you be faster or stronger. With colorful five stunning worlds: Spring, Summer, Fall, Winter and Special Islands and cute characters. Young audience and girls will love this game. To be completely honest, this game has some grounds to cover to keep the player enjoying the game for more than a month. The game can be very frustrating at first when you don’t know how the drift works, then the difficulty is not as pleasant when you go through the game. Some races have 5 laps and can be very long, and since the Computer is super good, you won’t be able to enjoy unless you love the challenge. The Time attack mode is very hard, I consider myself a Good racer, with well-managed drifts and a Mario Kart Black Belt, but on All-Star Fruit Racing, I found the challenge so hard to get that I stopped playing the time attack mode. We’re really waiting for the online mode to launch, that would bring more spices on the recipe. If you're a Mario Kart big Fan, you probably won't be enjoying this game, since it's very different. If you enjoyed Team Sonic Racing, and other franchise, then you will definitely spend time on this one. I appreciated the Fruit Juicer and the Combos you can launch during the game for defense and offense. Details on the races, visual elements and maps are outstanding and the quality is great. This game is more for Nintendo Switch players rather than PS4 Gamers or Xbox ones.